The woodchuck or groundhog is the largest member of the squirrel family in the Adirondacks and has grizzled, coarse fur. Above, the fur is brown to blackish brown, tipped with buffy yellow, white or cinnamon brown, except for the top of the head and most of the tail. The underparts are yellowish orange to chestnut. The cheeks and chin are buffy white to pale brown. Black (melanistic), partially black, or more commonly, blackish brown color phases, the guard hairs glossy (and lacking light) colored tips, are common. The body is compact, the legs short and thick, the head broad, short, and flat. The bushy tail is short, about 10- 15 cm (4-6 in) in length. The short, rounded ears and eyes are located at the top of the head, enabling a woodchuck to survey the area around the burrow without exposing most of the head. Large woodchucks are approximately 60 cm (24 in) in length, and weigh 13-33 kg (6-12 lb), the heavier weight typical of individuals entering hibernation. Herbaceous plants proved the bulk of the diet of this herbivore which may consume up to 681 g (1.5 lb) of vegetation per day. Clovers, grasses, dandelions, goldenrods, asters, and where available, alfalfa; garden crops such as corn, lettuce, peas, and beans are some of the plants the wood chuck prefers. The buds and even the barks of some deciduous shrubs and trees are spring foods, while fruits, especially raspberries, blackberries, blueberries, cherries, and apples form a part of the summer diet. Animal foods, chiefly insects, make up less than one percent of the diet. 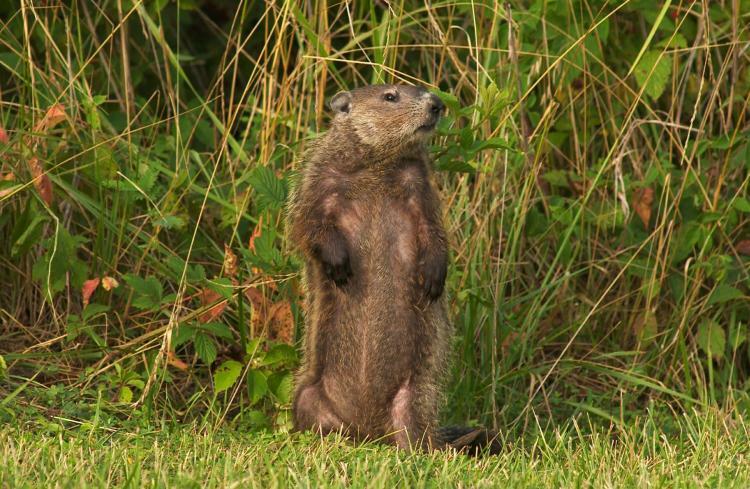 Woodchucks forage early in the morning and late in the afternoon during the summer, but mid-day in spring and autumn. Fat reserves rather than food caches supply the energy needed to sustain a woodchuck through the winter.